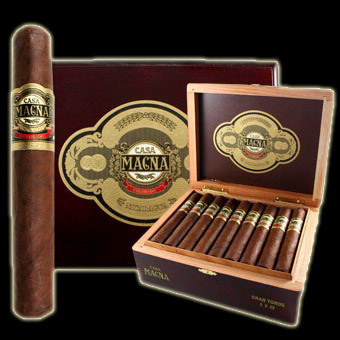 Produced through a cooperation between Nesto Plascencia and Fonseca's Manuel Quesada, Casa Magna Cigars are considered to be their greatest innovation to date, having received Cigar of the Year Honors in 2008 and a 93 rating from Cigar Aficionado and Cigar Insider. The cigar's tobaccos are extensively aged and carefully fermented then wrapped in a rare Cuban seed wrapper and placed in cedar vaults. These slow burning, long-filled cigars produce rich notes of earth wood and toasty aromas. The Casa Manga and the Casa Magna Oscuro are both winners, and true works of art, so act now on these limited production cigars.